It increases the level cap and adds heaps of new content. The developers of Median XL describe their creation as "the greatest Diablo II full conversion mod", and you know, they might have a point. It's a massive modification that adds piles of new skills and items, improved AI, endgame "uberquests" and more. It's where you go when you want more Diablo, but you don't want to turn to Diablo III. The enormo-mod just got even more, er, enormous with its 2017 update, which arrived a few days ago. You can find the full changelog here, and grab the mod itself from here, and if you don't fancy combing through that huge document, I've summarised the main additions below. Firstly, the maximum character level has been increased to 125, although "the last 5 levels are very difficult to obtain". Gold is now automatically picked up outside of act towns, the damage cap has been removed, the monster health cap has been ditched, while the "highest possible character resistances have been capped to 90%". Meanwhile, third-party cheats have been disabled, and the engine will now support more areas, meaning "new ubers will be added, without replacing existing areas". Which is nice. On top of all that, there are a ton of tweaks to game balance, skills, bosses, those uberquests and more, plus new items, challenges—look, it's pretty big. 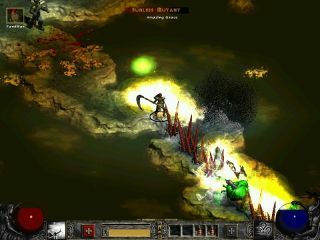 While you're waiting for Diablo 2 to install, you can read more about Median XL on the official site.